A month or two ago, the Daily Memphian did a battle of the sliders: The Dirty Crow Inn vs. Bardog Tavern. I commented at the time that it was somewhat ironic that those two businesses went head to head, but I could say no more at that time. Now the secret is out: Aldo, owner of Bardog as well as the two Aldo’s Pizza Pies and the (soon to be) two Slider Inns, has bought the Crow. The food court at 910 Madison in the Medical Center is almost ready to go. It will be open to the public 10 AM to 2 PM and restaurants will include Soi Number 9, Coletta’s Italian Restaurant, and Southern Hands restaurant. Cruisin’ Heavy will be the headliner at the Peabody rooftop party tomorrow night, Thursday, April 18. There will be a guest performance by Fletcher as well. $15 cover charge or you can buy a VIP pass that gets you in for the entire party season that runs through August. Admission includes a buffet of pizza rolls and mini corn dogs with mustard. If you’re in VIP you get a second buffet of assorted gourmet pizzas, hamburger sliders, and onion dip with crostini. 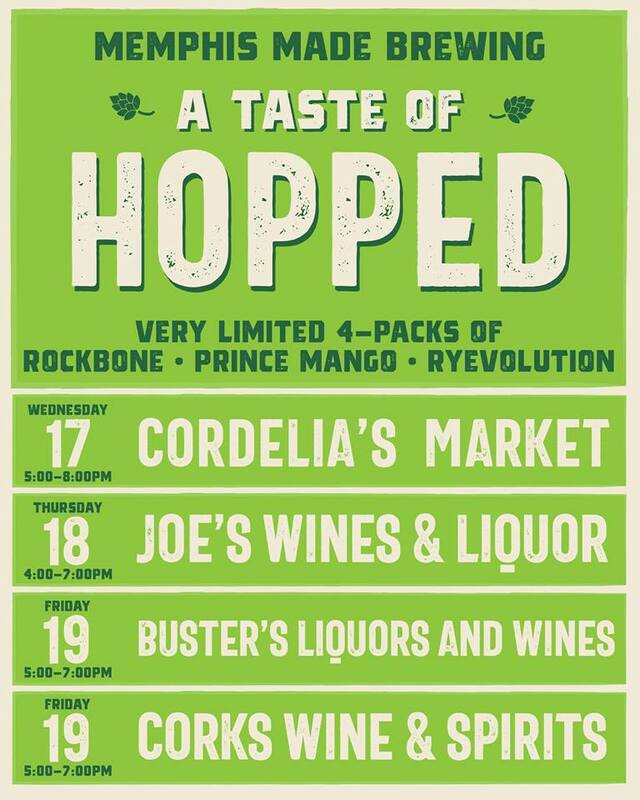 Memphis Made Brewing Co. will be at Cordelia’s Market tonight with some special packs of beer as the brewery gears up for its birthday celebration, Hopped. The Cousins Maine Lobster food truck will be at Ghost River Brewing Co. at Main and Crump tonight from 4 to 8. Comedian Aziz Ansari will be at the Cannon Center tonight with his Road to Nowhere tour and the most ridiculous cell phone policy I have ever seen. The annual Africa in April cultural awareness festival is in Church Park on Beale Street this weekend. This year the honored country is Nigeria. Bike Night on Beale returns tonight. Every Wednesday, you can park your motorcycle on Beale Street and check out everyone else’s rides. It’s Woof Wednesday with the Redbirds tonight. There will be a special ticket that gets you and your dog into AutoZone Park for tonight’s game. Dog owners must sign a waiver and enter through the Fourth Street gate. First pitch is 6:35. Wiseacre is having a beer pairing class at their taproom this Saturday: Beer and tacos! There will be 2 PM and 4 PM seatings that include a tour of the brewery, a breakdown of beer styles and flavors, four tacos from Maciel’s, and all the Pancho’s cheese dip you can eat. All right, that’s it for this post. Everyone get out and enjoy today, because tomorrow looks like it’s going to be a very wet one. Back tomorrow with more news.